A marketing technology stack is the sum of all the digital marketing tools you use for your business. Mine has evolved considerably since my first blog in 2006 and even more since launching Simple Marketing Now in 2009 when I was using GoDaddy's Website Tonight + Blogger + Feedburner + MailChimp + Google Analytics. Most businesses today can't operate without using digital marketing tools. At the same time, all of that technology needs to be useful and enable people to shine where and when it matters most in your customer's journey (see The Marketing Technology Paradox: People Matter More Than Ever!). That's what makes the Stackies so interesting. Who is Behind the Stackies? 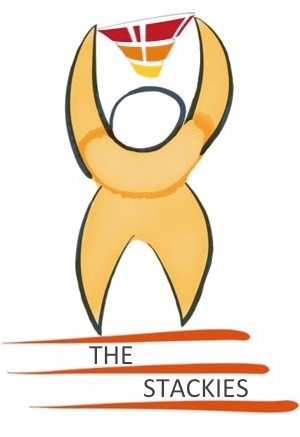 Do you follow ChiefMartec.com, aka the Chief Marketing Technologist Blog by Scott Brinker? He's keeper of the Marketing Technology Landscape which he launched in 2011 (see Marketing Technology Landscape Infographic) and which in 2015 included "1,876 vendors represented across 43 categories." Yikes! Per Where in the world is the 2016 marketing tech landscape?, the landscape continues to grow! Scott also came up with the concept of the Stackies. 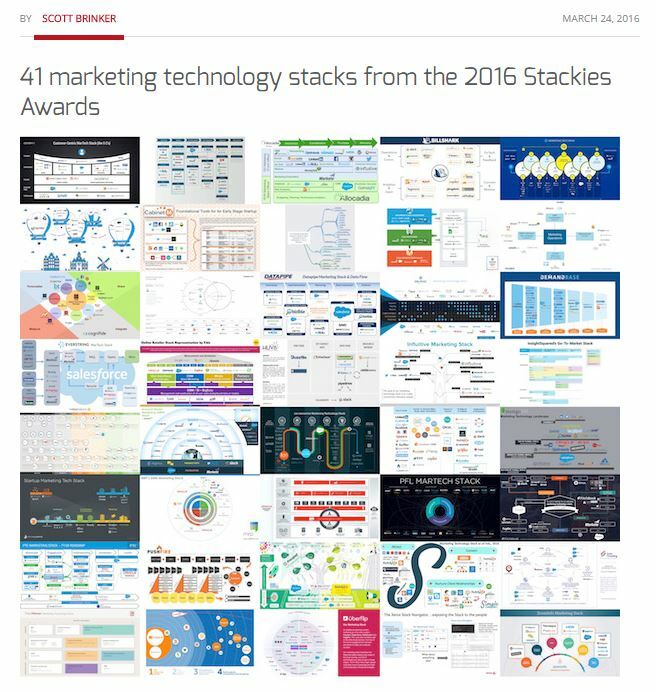 As he explains in "Announcing the 2016 Stackies to be awarded at MarTech,"
"Marketing technology stacks — the collection of marketing technology products that your company uses and how they’re conceptually organized — are an important part of modern marketing management. We can learn a lot by seeing how our peers conceive of their stacks and the pieces that they assemble together." Why Think About Your Marketing Technology Stack? As simple and straightforward as your business may be, chances are that it uses marketing technology in some way, manner or shape. To update your online web and blog content, you may have embraced an easy-to-administer and access online content management system. It does get complicated because all of these digital technologies need to be coordinated. Ideally, they should be 'speaking' to one another in the same language and in real time. To make matters even more exhausting, new tools promising all kinds of benefits continue to crop up and determining their value can distract you from focusing on what needs your attention. 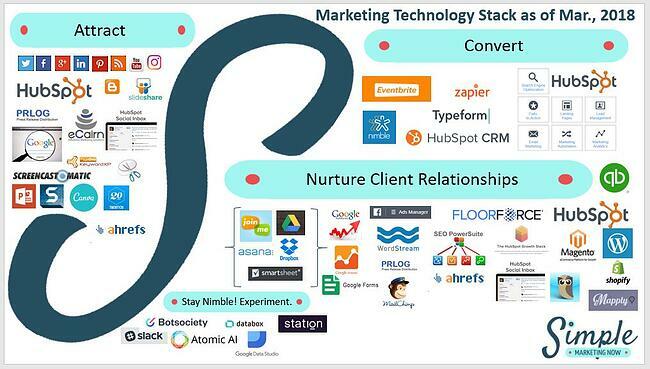 Thinking about your marketing technology stack - and depicting that visually - means you have an opportunity to step back and think about all of your digital tools, organize them in a way that makes sense and that, ideally, delivers value to prospects and customers. That process may even help you identify gaps or duplications in your stack. 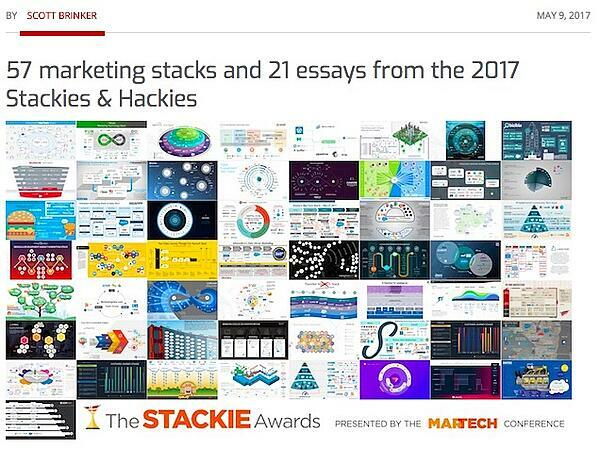 And, then, thanks to the Stackies, you get to learn about other organizations' stacks and their logic for selecting and organizing their own digital tools because all of the entries are shared (see 21 marketing technology stacks shared in The Stackies). Here is Simple Marketing Now's 2018 Marketing Stack. I organized my stack into four categories. The first three - Attract, Convert and Nurture Client Relationships - have been part of my stack since 2016. Attract is all about content creation on the website and three blogs and sharing that content via social channels. I've included the tools I use for visuals, for researching content ideas and keyword concepts. Convert focuses on nurturing and developing contacts from the work done in Attract. Tools there allow me to create Call-to-action buttons, landing pages, lead-nurturing sequences, as well as emails, not to mention analyze behaviors, manage web page performance and more. In Nurture Client Relationships, the tools either directly benefit clients (i.e., help them attract and convert) or facilitate collaboration with clients. The fourth category came about in 2017 when I realized that I'm constantly experimenting with new technology to stay aware of new tools. Stay Nimble! Experiment is my sandbox for trying new technology tools. I may experiment with clients or simply on myself. That said, the challenge continues to be balancing the client nurturing with taking care of Simple Marketing Now and attracting/converting new clients. Staying focused is critical! That's where Headspace and time management come in! Keep it simple for clients. Keep it manageable for Simple Marketing Now. Always remember that the tool must deliver value otherwise it's a drain. As you might imagine, the Stackies represent a goldmine of ideas, tools to consider, and concepts to apply to your own business. I'm realizing another benefit: appreciating how marketing technology stacks evolve. They are beautiful living entities and should reflect the changes your business goes through. Here's the link to the 2017 entries: 57 marketing stacks and 21 essays from the 2017 Stackies & Hackies. 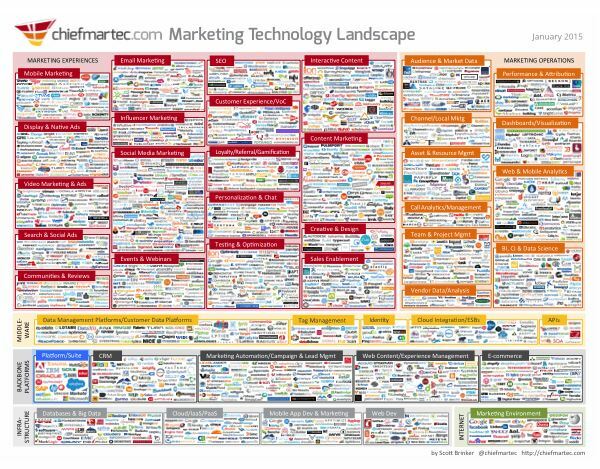 Have you thought through your own marketing technology stack? What does it look like? How well do the pieces work together? I'd love to hear. Thanks to Scott Brinker for the inspiration. Note: This article was originally published on 2/8/16, updated on May 16th, 2016 and has become even more up-to-date with this article!